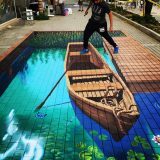 Tracy Lee Stum is an internationally recognized chalk artist / streetpainter who specializes in large interactive 3D chalk art. 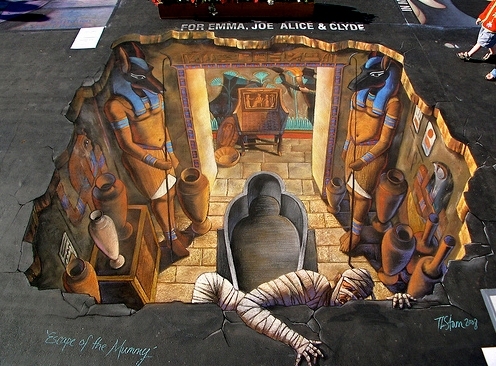 Her painting below, titled “Escape of the Mummy”, was created in 2008 for the Youth in Arts Street Painting Festival in San Rafael, California. 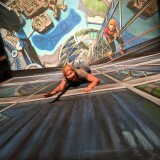 The painting took 2 1/2 days to complete and measured 12 feet wide by 12 feet tall upon completion. Stum took inspiration from the Indiana Jones and Mummy movie franchises when coming up with this concept. 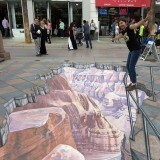 More works from this artist can be viewed at TracyLeeStum.com.